The original Thanksgiving goes all the way back to 1619 near Plymouth, Massachusetts and was actually an anniversary of the settlement there. There is some historical evidence that Spanish explorers observed a Thanksgiving feast in 1655 while in Florida. The date credited to the origin of Thanksgiving was in 1621 because of the colony’s first successful harvest. A little known fact is that in 1623, the Thanksgiving feast included fasting and prayer for God’s provision. 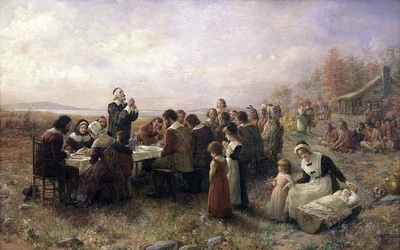 It is hard to imagine a fast during Thanksgiving today but giving thanks and fasting were common practice in pre-Colonial America. It was not until the 1660’s that the Thanksgiving feast became an annual event. Prior to that, it was a feast of thanksgiving to God and not necessarily a large meal. Giving thanks in such dire circumstances seems ironic in contemporary America. For most of the Early Americans, it was observed on dates that the states individually felt best. It was not until 1863 that President Abraham Lincoln, under the influence of Sarah Josepha Hale, unified the nation in observing Thanksgiving on the final Thursday of each November. When I used to teach Sunday school, I asked my students if Thanksgiving was in the Bible. They all agreed that, no it was not in the Bible. I told them that thanksgiving, little “t”, was in the Bible but it was not the same as the national holiday that America and Canada celebrate. Giving thanks is an offering to God. One of the offerings that were voluntary was that which was called the Peace Offering. This is found in all of Leviticus chapter 3 and in Leviticus 7:11-34. This was a freewill offering of thanksgiving to God for all He has done. This was one of the few offerings that was not commanded but was to come from the heart of the worshipper. The New Testament and Old both mention giving thanks to God. Psalm 106:1, "Praise you the Lord; for he is good: for his mercy endures forever." Psalms 140:1, "Surely the righteous shall give thanks unto Your name: the upright shall dwell in thy presence." Psalms 92:1, "It is a good thing to give thanks unto the Lord, and to sing praises unto Your name, O most High" Colossians 3:17, "And whatsoever you do in word or deed, do all in the name of the Lord Jesus, giving thanks to God and the Father by him." We can see that giving thanks is a free will offering that is well pleasing to God. It is hard to grumble for your circumstances when we are giving Him thanks. Hebrews 13:15, "... let us offer the sacrifice of praise to God continually, that is, the fruit of our lips giving thanks." Psalms 54:6, “Willingly I will sacrifice to You; I will give thanks to Your name, O Lord, for it is good.” Psalms 86:12 (Psalms 9:1; 138:1), I will give thanks...with all my heart.” When you give thanks willing to God it is actually a sacrifice to Him. He is well pleased with this. So I pray you will always be thankful to God just as I thank God for all you all (Col. 3:15).